New Delhi, Oct 18 (IANS) Countering the BJP’s attack on Congress President Sonia Gandhi’s son-in-law Robert Vadra and terming it a ‘witch hunt’, the Congress on Wednesday demanded to know who paid for over 100 trips Prime Minister Narendra Modi made by chartered plane across India and abroad when he was the Gujarat Chief Minister between 2003 and 2007. The party also accused the BJP of trying to divert attention from allegations against BJP President Amit Shah’s son Jay Shah by raising the Vadra issue. Congress spokesman Abhishek Manu Singhvi said the estimated cost of these air travels was around Rs 16.56 crore. “The nation wants to know, we want to know, as to who paid for these chartered plane travels by Modi. No information has been furnished till date in response to an RTI query made in 2007,” Singhvi said. Defending Robert Vadra in a case of alleged favour he took from arms dealer Sanjay Bhandari, Singhvi said the mails selectively leaked by the government prove nothing against the son-in-law of Congress President Sonia Gandhi whereas details of Modi’s travels have been officially sought through the RTI. 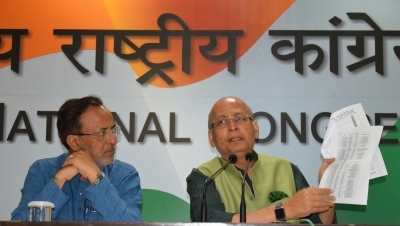 Singhvi disclosed, based on RTI revelations, that Modi travelled to Switzerland (July 1, 2007), South Korea (June 16, 2007), Japan (April 15, 2007) and China (November 1, 2006) along with some well-known industrialists and business tycoons. “They are all by charter firm called Planet Aviation,” he said. Waving a picture of Bhandari with Civil Aviation Minister Ashok Gajapathi Raju, Singhvi alleged that he was close to Bharatiya Janata Party leaders. The Congress leader also demanded to know how Bhandari was allowed to flee abroad in December 2016 even though his passport had reportedly been impounded by the government in June that year. The BJP had on Tuesday asked the Congress to explain the alleged links between Vadra and arms dealer Bhandari. Citing the documents which were received by Gujarat CLP leader Arjun Modhwadia on the travel of the then Chief Minister of Gujarat through RTI replies in 2007, Singhvi asked who paid for the 100 trips. “Deafening silence continues, he has recrived no reply to his RTI. These trips, are clearly trips by a constitutional functionary, position holder, they are provided for by private persons and we do not have any accounts of them. “We must have an accountability first,” he said. Singhvi also said that of the amount Rs 16.5 crore (for the 100 trips), Rs 5 crore was for four foreign charters. “The people accompanying these charters include industrialists like Sudhir Mehta of Torrent, Parimal Nathwani, Pankaj Patel of Cadila, Prasad Menon of Tata, Harishankaran of ILFS, Nikhil Meshwani of Reliance, Rajeev Jyoti of Bombay Rubber, Gautam Adani, H.K. Patel, B.K. Goenka,” said Singhvi. He also said under the law, any constitutional position holder, cabinet Minister or Chief Minister – must declare a gift above Rs 500. 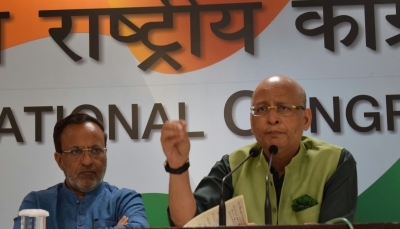 “If the state government has not paid for these trips even partially, it is deemed to be a gift to that constitutional position holder,” said Singhvi. “It is not a question of doing for Vibrant Gujarat or for Gujarat’s Industry’, it is the question of receiving a benefit from beneficiaries of Gujarat’s Industrial Policy because somebody has to pay,” he added. Defence Minister Nirmala Sitharaman on Tuesday asked the Congress party to explain the alleged links between Vadra and Sanjay Bhandari. Defending Vadra, Singhvi said: “The government could not find anything in 41 months. We have not heard of any conviction and no prosecution successful. “Vadra’s lawyer had said in a written statement that he owns no such property and the emails are manufactured,” he added. Singhiv also pointed out that Sitharaman selectively did not mention that the government had earlier proudly listed as their achievement the import of Swiss-made basic trainer aircraft Pilatus, which was completed in 2015. Bhandari’s company, Offset India Solution Private Limited, is under the scanner for alleged corruption in the Pilatus deal.